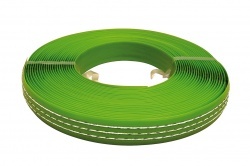 Electric Fencing Tape to keep Snails and Slugs away from your garden! Available in 20m and 50m rolls. Full Snail Electric Fence Kits also available. What we say: Snail Electric Fencing has been popular across Europe for years. Now all garden lovers in the UK are beginning to catch on to the trend! We've just put one on our veggie patch!